When commercial productivity and premium deep core results count, this unit delivers up to 42,550 sq. 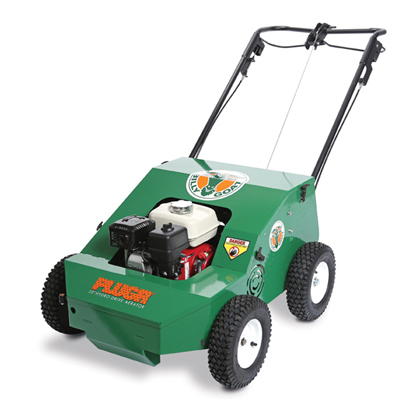 ft. of aeration per hour and punches core depths to 2.75" even in hard soil conditions. The 25" wide 2500H features 8 reciprocating cam driven tines that propel the unit forward with variable 3-speed control from 2.5 - 3 mph and allows for a denser hole pattern at slower speed where needed. Ideal for flatter conditions. 196 cc Honda 8 Up to 2.75" 3.63" x 6" 360 lbs.